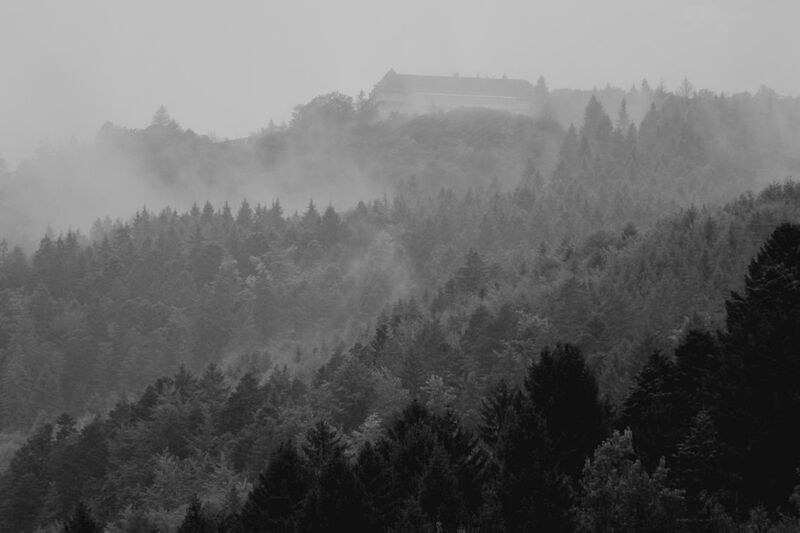 When the mist clears, and if in your imagination you replace the modern building with a distinguished Victorian hotel, you will see an alluring destination for travellers in the Vosges during the period before the Great War. and the modern sanatorium is on the site of the fabulous Hotel Altenberg with its exceptional panorama. At 1059 m, the luxurious Altenberg was a short walk from the frontier at Col de la Schlucht (1139m). (The original 1896 hotel was destroyed during the Great War and a new hospital building was built on the site between 1922 and 1926. It closed in 2011.) 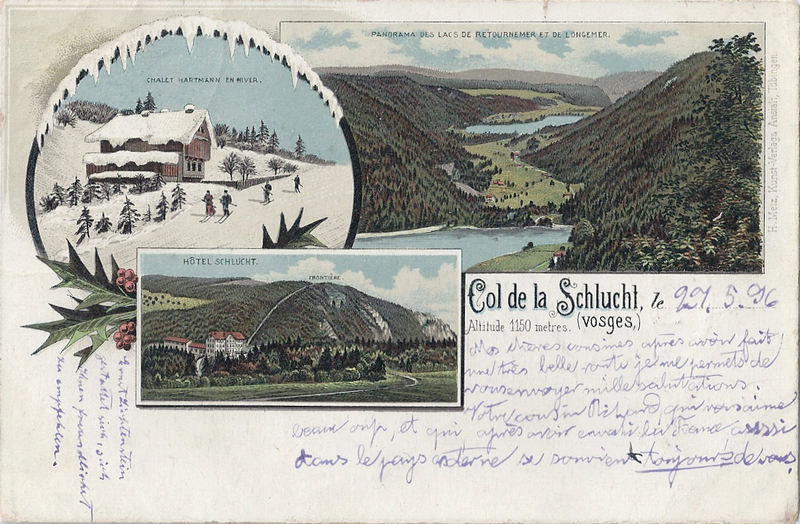 La Schlucht was a popular destination, well supplied with restaurants, hotels and cafés where the intrepid traveller could relax after a stimulating walk in the French Hautes Vosges, contemplate the lost region of Alsace and breathe in the energising mountain air. There were customs buildings for French and German officials. It is, of course, possible for energetic people to walk up to la Schlucht from Munster or Gérardmer, or to travel by horse. 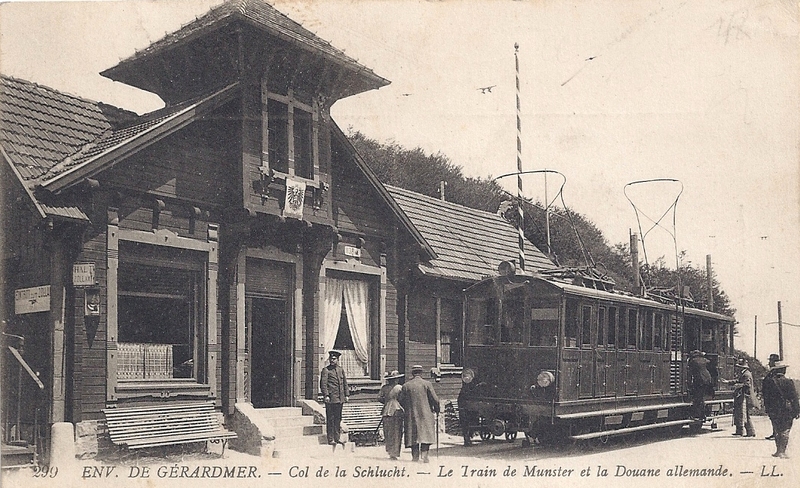 In 1902, the embryonic idea of running a railway up to the Col and down the other side to Gérardmer began to take shape and a tramway was built. 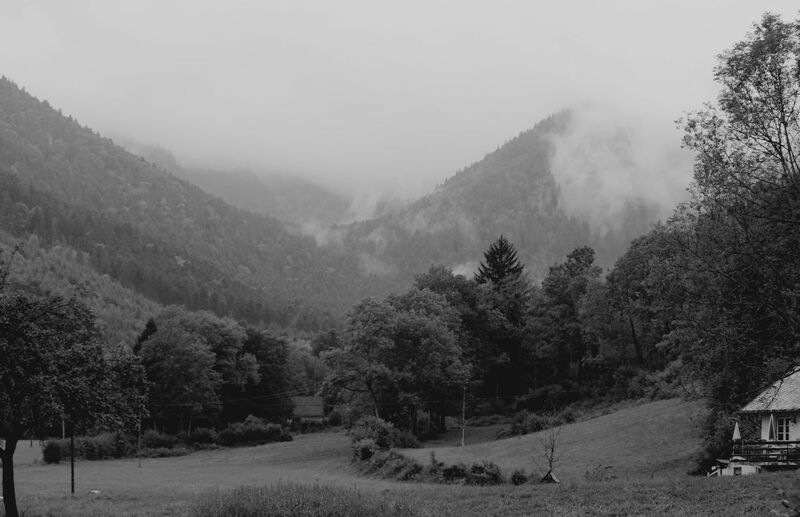 This opened up the beautiful valley and Col to tourists from Colmar, who could travel to Munster by train and board a tram, and visitors from further afield. It was a summer service and half a million people took advantage of it between 1907 and 1913. It is still possible to see the slightly elevated embanked track (minus rails) along which the tram travelled. 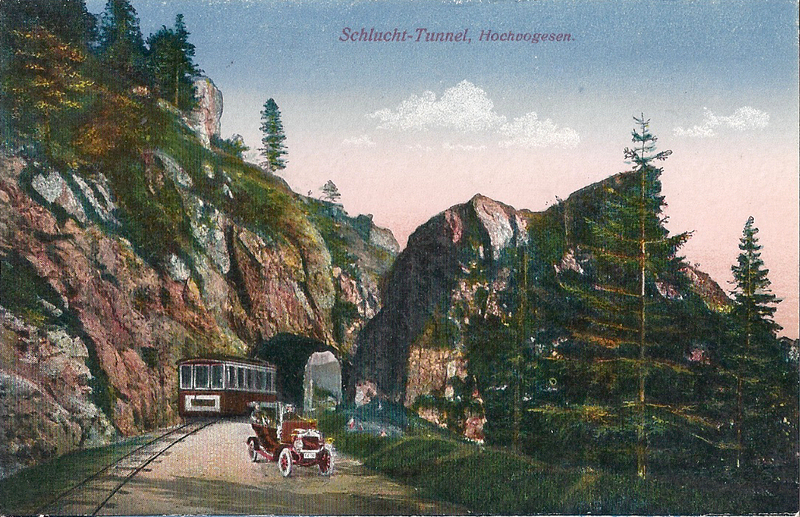 When the flat valley reached the sides of the pass, the tramway began to climb at 7.5 kph up slopes of 22% until it reached the Hotel Altenberg. and eventually reached Col de la Schlucht. There, the customs officers awaited in their official premises at the frontier. 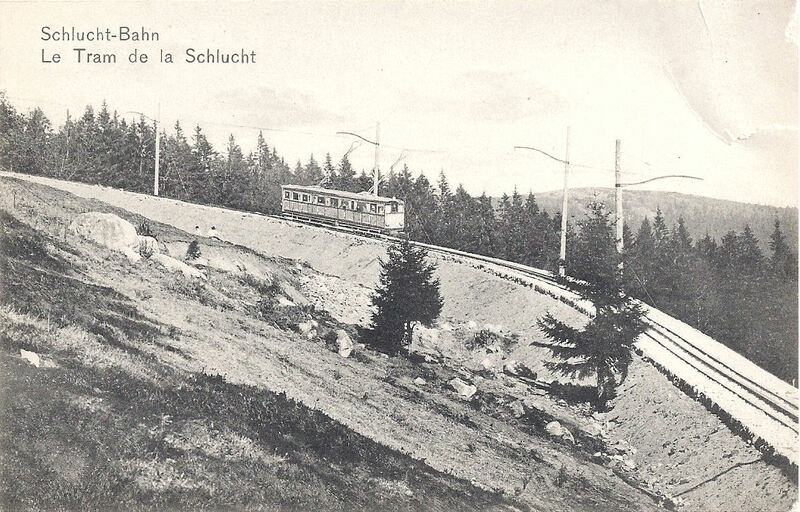 There is much more to say about Col de la Schlucht and the trams in future posts. 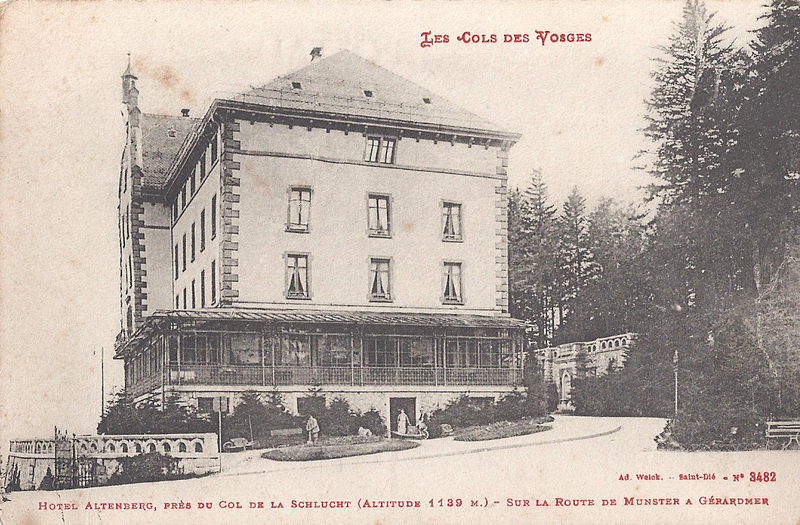 When the Great War broke out, the French army took the Hotel Altenberg. The tourist trams were used in the early weeks of the war for the transport of troops and the evacuation of wounded soldiers. 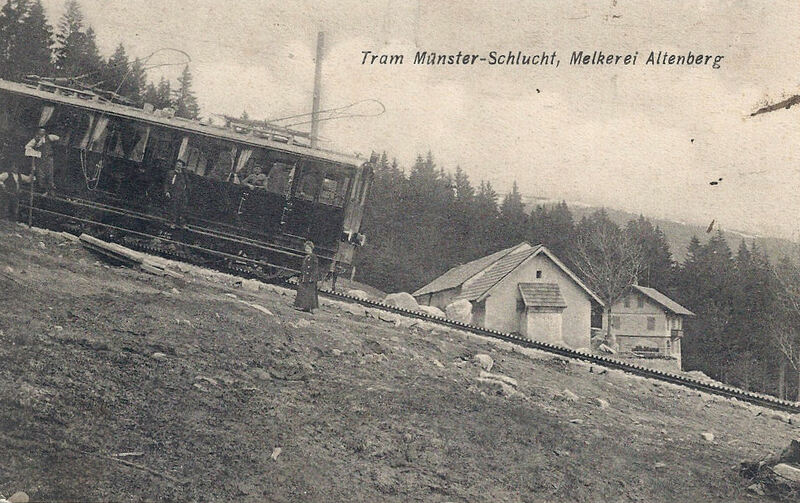 This stopped when the German troops cut the electricity supply to the tramway. and the German side of the front. 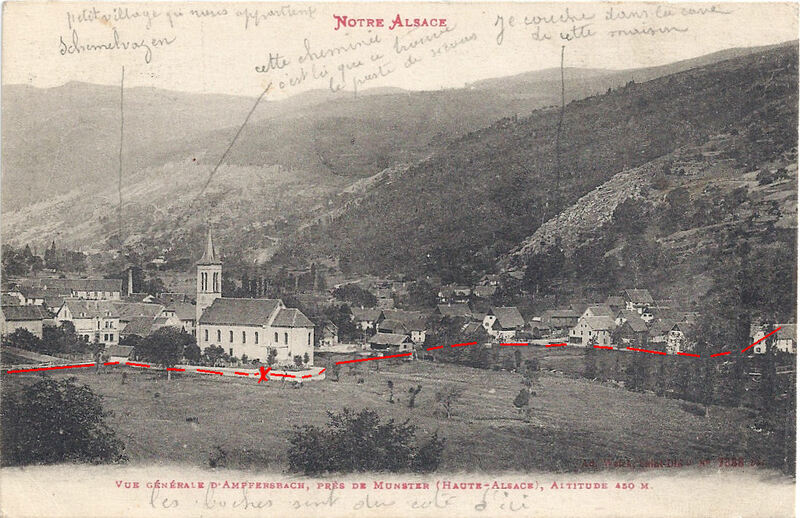 According to his message, the X near the church marks the place behind the cemetery wall where he was guarding the trenches. Sadly, he didn’t date or sign his card. In very faint pencil marks, he marked his trench line. I have traced his line in red. It’s a privilege beyond words to have bought such a detailed snapshot of someone’s war for five euros. Ampfersbach and the Hotel Altenberg are in Alsace, in the territory annexed by Germany. 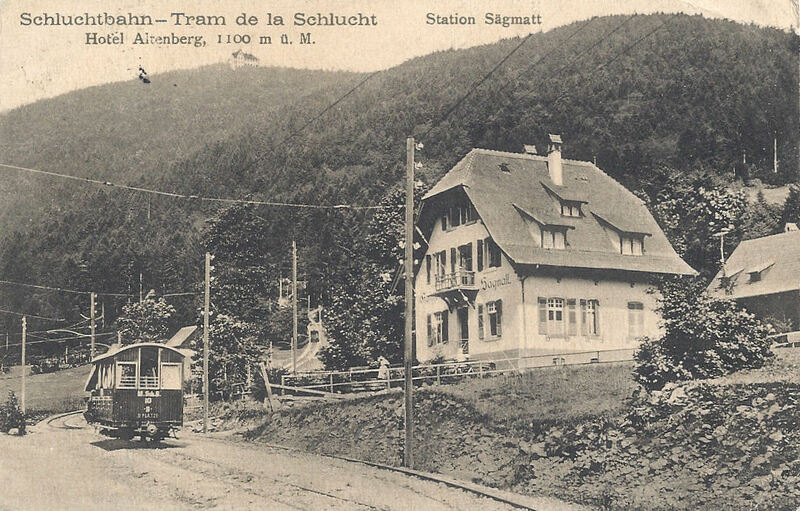 Statistics about the tram sourced from La Vallée de Munster: Le Tramway Munster-Schlucht et les environs de la Schlucht by Gérard Jacquat and Gérard Leser. Categories: Alsace at War - 1914-1918, The frontier, Touring and tourism, War in the Vosges - 1914-1918 | Tags: Alsace, Ampfersbach, Col de la Schlucht, First World War, frontière, frontier, Great War, hiver Vosges, Hotel Altenberg | Permalink.